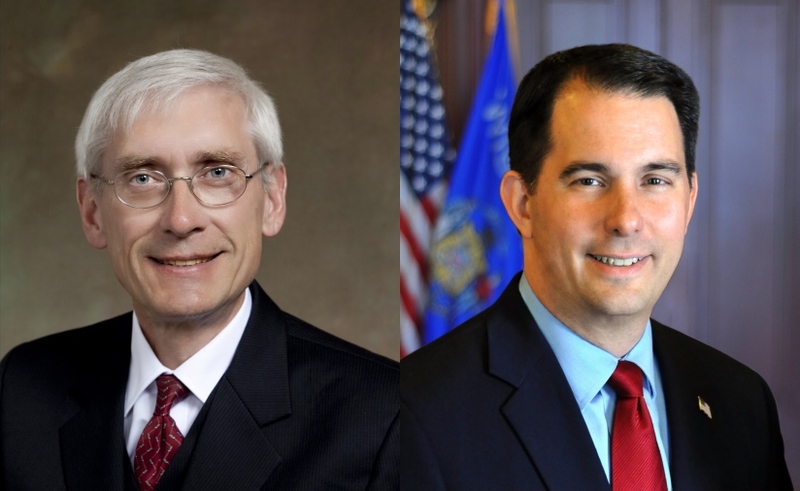 Among all registered voters surveyed in the poll, Walker receives 47 percent in the race for governor, with Evers receiving 44 percent and Anderson at 5 percent. In the Senate race, among all registered voters, Baldwin receives 52 percent and Vukmir 42 percent. For attorney general, registered voters give Schimel 45 percent and Kaul 43 percent. The poll was conducted Oct. 24-28, 2018. The sample included 1,400 registered voters in Wisconsin interviewed by cell phone or landline, with a margin of error of +/- 3 percentage points. For likely voters, the sample size is 1,154 and the margin of error is +/- 3.2 percentage points. The results for likely voters are based on the definition that the Marquette Law School Poll has used since it began in 2012: those who say they are certain they will vote in November. Alternative models of likely voters could be broader, including those saying they are less than certain to vote, or could include enthusiasm and attention to politics. Table 1 shows the vote for governor by alternative measures of likelihood of turnout averaging over certainty of voting, enthusiasm and attention to politics. Evers’ percentage of the vote generally rises when turnout is projected to be lower, while Walker’s vote percentage changes little in different projections of turnout. Vote for the Senate using different assumptions about voter turnout is shown in Table 2. Vote for attorney general by different likely voter criteria is shown in Table 3. Table 4 shows favorable, unfavorable and unable-to-rate percentages in the early and late October polls. Among likely voters, 25 percent say health coverage is their most important issue, followed by 20 percent choosing K-12 education and 20 percent picking jobs and the economy. The condition of roads ranks fourth, with 12 percent choosing it as most important. Asked for their second-most-important issue, the condition of roads rises to the top 3, with K-12 education first at 20 percent, health coverage at 18 percent and the condition of roads at 16 percent. Jobs and the economy is picked by 13 percent. The full set of most-important-issue responses is shown in Table 5. Among those ranking health coverage as their most important issue, Evers is supported by 65 percent and Walker by 32 percent. For those saying K-12 education is their top issue, 70 percent support Evers and 21 percent back Walker. Those who say jobs and economy are most important give Walker 74 percent to Evers’ 20 percent. Those most concerned about roads support Evers with 50 percent and Walker with 47 percent. In the Senate race, among those ranking health coverage as their most important issue, Baldwin receives 70 percent and Vukmir 27 percent. For those saying K-12 education is their top issue, 73 percent support Baldwin and 24 percent back Vukmir. Those who say jobs and economy is most important give Vukmir 71 percent to Baldwin’s 26 percent. Those most concerned about roads support Baldwin with 63 percent and Vukmir with 36 percent. The electorate has become increasingly segmented by gender and education among white voters, with longer-standing differences by race. Table 6 shows preference for governor among white males and females by education, and for non-whites or Hispanic likely voters. The sample size for non-white or Hispanic voters is too small to analyze by gender and education. Evers receives his strongest support from white, female college graduates and from nonwhite and Hispanic voters, while Walker does best with white, male noncollege graduates and has a smaller lead among white males with a college degree. Non-college white females give the edge to Evers. Partisans are strongly supporting their party’s candidate, but independents are currently favoring Evers by 7 percentage points, as shown in Table 7. Preferences in the contest for U.S. Senate by race, gender and education are shown in Table 8. Baldwin does best with white, female college graduates, but also holds a substantial advantage among non-college white females. White college males tilt slightly to Baldwin, and Vukmir has a substantial advantage with non-college white males. Baldwin has a substantial lead among non-white and Hispanic voters. The senate vote by party is shown in Table 9. Partisan alignments are strong, although Vukmir’s support among Republicans is not as strong as Baldwin’s is among Democrats. Independents favor Baldwin. In the attorney general race, the poll results are shown in Table 10 and Table 11. Schimel has a lead among both non-college and college white males, while Kaul has an advantage with both college and non-college white females and among non-white and Hispanic voters. Schimel holds 89 percent of Republican support while Kaul receives 87 percent support from Democrats. Independents give Schimel 42 percent and Kaul 45 percent. Both candidates for attorney general remain less well-known than the gubernatorial and senate candidates. Fifty-five percent of registered Wisconsin voters see the state as headed in the right direction while 40 percent think the state is off on the wrong track. In early October, 54 percent said right direction and 40 percent said wrong track. In late October 2014, 51 percent said the state was headed in the right direction and 44 percent said it was on the wrong track. Among likely voters in the current poll, 54 percent say the state is headed in the right direction and 42 percent think the state is off on the wrong track. Thirty-seven percent of registered voters think the state budget is in better shape than a few years ago, while 29 percent say it is about the same and 25 percent say the budget is in worse shape. In late October 2014, 44 percent said the budget was in better shape than a few years earlier, 23 percent said it was about the same and 27 percent said the budget was in worse shape. When asked to balance property taxes with spending for public schools, registered voters say they would rather increase spending on public schools than reduce property taxes, by a 55 percent to 40 percent margin. Support for additional spending on public schools has increased since the question was first asked in 2013. The full trend on this issue is shown in Table 12. For those likely voters who rank K-12 education as their most important issue, 84 percent would increase school spending while 14 percent would hold down property taxes. For those who do not rank K-12 education as the most important issue, 49 percent would increase spending while 45 percent would hold down taxes. Fifty-eight percent of registered voters think that salary and benefits for teachers in Wisconsin should be higher, 32 percent say they are about right and 4 percent think salary and benefits for teachers should be lower than they are now. Asked what would be their first priority for improving student success in Wisconsin schools, 28 percent choose improved parenting while 25 percent pick more resources for schools. Twelve percent say more options for choosing schools and 11 percent say improved teaching. Improved early childhood programs is the choice of 9 percent, and 7 percent say better school leadership. While respondents would pay higher taxes to increase spending on public schools, they are unwilling to increase gas taxes and vehicle registration fees in order to increase spending on roads. Fifty-nine percent say it is more important to keep gas taxes and vehicle registration fees where they are now, while 36 percent say it is more important to raise gas taxes and registration fees in order to spend more on roads and highways. In early October, 61 percent preferred to keep taxes and fees down while 32 percent said they would increase taxes in order to spend more on roads. Among likely voters who rank roads as their most important issue, 51 percent are willing to increase gas taxes and registration fees. Among those who do not rank roads as the most important issue, 60 percent are not willing to change taxes and registration fees. This is shown in Table 13. Forty-one percent of registered voters think the Foxconn plant will provide at least as much value as the state is investing in the plant, while 40 percent think the state is paying more than the Foxconn plant is worth. Eighteen percent say they don’t know if the plant will be worth it or not. This question was first asked in March 2018, and this is the first time that more voters said Foxconn would be worth as much as the state is providing in support. A majority (58 percent) of registered voters statewide believe the Foxconn plant will substantially improve the economy of the greater Milwaukee area, while 27 percent do not think it will and 15 percent say they don’t know. When asked if businesses where the respondent lives will benefit from Foxconn, 33 percent say businesses will benefit directly from the Foxconn plant, while 55 percent say their local businesses will not benefit and 12 percent don’t know. Eleven percent of registered voters say the state has done a lot to address the issue of opioid addiction, with 29 percent saying the state has done a fair amount about the issue. Thirty-two percent say the state has done only a little and 18 percent say it has done almost nothing. Ten percent say they don’t know what the state has done with respect to the opioid issue. Fifty percent of registered voters say they approve of how Walker is doing his job, while 46 percent disapprove. The trend in approval since June 2018 is shown in Table 14. In October 2014, 48 percent approved and 49 percent disapproved. Among all registered voters (see Table 4, above, for likely voters), 45 percent have a favorable opinion of Baldwin and 40 percent are unfavorable. Baldwin is not rated by 14 percent. The trend in Baldwin favorability since June is shown in Table 15. A large majority of registered voters, 82 percent, say the Affordable Care Act’s requirement that preexisting conditions be covered by insurance companies is very important to them. Thirteen percent say such coverage is somewhat important, with 2 percent saying it is not too important and 1 percent saying it is not at all important. President Donald Trump has a 47 percent approval rating, with 50 percent disapproving. In the previous Marquette Law School Poll in early October, his approval was 46 percent, with 51 percent disapproving. Partisans are deeply divided on Trump’s job performance, as shown in Table 16. Asked if Trump has changed the Republican party—and if so, how—28 percent say he has changed it for the better, while 47 percent say he has changed it for the worse and 21 percent say he hasn’t changed it much either way. Twenty-seven percent of registered voters say they have tried to convince someone to vote for or against a particular candidate, while 72 percent say they have not done so. Forty-six percent say they talk with family and friends about politics more than once a week and 23 percent talk about politics once a week. Thirteen percent talk once or twice a month and 9 percent talk a few times a year. Nine percent say they never talk politics with family or friends. Thirty-three percent say they have stopped talking about politics with someone because of disagreements about the elections. In October 2014, 27 percent said the same. Registered voters are paying varying amounts of attention to campaign events and debates in Wisconsin. Table 18 shows the attention paid to President Trump’s campaign rallies and to the debates for governor, senator and attorney general. Overall, 70 percent of registered voters say they are very enthusiastic about voting in this year’s elections, with 19 percent somewhat enthusiastic and 10 percent either not very or not at all enthusiastic. Among Republicans, 74 percent are very enthusiastic, while among Democrats 81 percent are. Among independents, 58 percent say they are very enthusiastic about voting this year. In early October, 70 percent of Republicans and 76 percent of Democrats were very enthusiastic, with 59 percent of independents. The Marquette Law School Poll is the most extensive statewide polling project in Wisconsin history. This poll interviewed 1,400 registered Wisconsin voters by landline or cell phone, Oct. 24-28, 2018. The margin of error is +/-3 percentage points for the full sample. For likely voters the sample size is 1,154 and the margin of error is +/- 3.2 percentage points. Fourteen issue questions were asked of half the sample. Questions on Form A have a sample size of 691 and a margin of error of +/- 4.2 percentage points. Questions on Form B have a sample size of 709 and a margin of error of +/- 4.2 percentage points. Form A asks four questions about political conversations and three questions about Foxconn. Form B items include views of tariffs, free trade agreements, undocumented immigrants, abortion, how the state has handled opioids and two items on education concerning teacher salaries and priorities for improving education. The partisan makeup of the sample, including those who lean to a party, is 47 percent Republican, 45 percent Democratic and 7 percent independent. The long-term total for the previous 49 statewide Marquette polls, with 44,152 respondents, is 43 percent Republican and 47 percent Democratic, with 9 percent independent. The partisan makeup of the current sample, excluding those who lean to a party, is 32 percent Republican, 30 percent Democratic and 37 percent independent, compared to the long-term totals of 27 percent Republican, 31 percent Democratic and 41 percent independent. Among likely voters, the partisan makeup of the sample, including those who lean to a party, is 46 percent Republican, 47 percent Democratic and 6 percent independent. The partisan composition among likely voters, excluding those who lean to a party, is 33 percent Republican, 32 percent Democratic and 33 percent independent.